But writing an exceptional compare and contrast paper does take effort and planning. 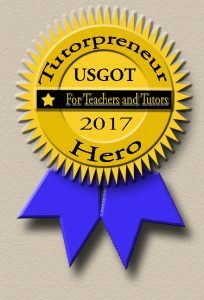 An excellent compare and contrast paper reveals something unique about a topic. It dives into the topic and reflects on the importance of what is compared and contrasted. So, creating a paper that does this requires preparation and action. Students need to write in-depth details about the subjects they compare and contrast. They need to analyze and critique the characteristics of the subjects in their papers. Here are 5 essential steps to help you create a topnotch compare and contrast paper. See how they help you plan and write a paper with great content and critical thinking. A compare and contrast paper analyzes 2 or more subjects for similarities and differences. These subjects have something in common. For example, you can write about 2 versions of the same movie. The movies are of the same subject but are from different years. Your paper could compare and contrast the original Ghostbusters (1984) movie with the remake Ghostbusters (2016). Here you would describe the similarities and differences between these 2 films. Then consider which one is better, and why it’s better. Compare and contrast world leaders. Compare and contrast home schools, public schools and private schools (you can select all of these or choose 2 categories). Compare and contrast characters in a novel. Compare and contrast wind energy and solar energy. Compare and contrast 2 or 3 works of art from the same artist. These are ideas to get you thinking. Brainstorm your own ideas and select what interests you. Now that you have 2 or 3 subjects you want to compare and contrast, think of all the characteristics or points of each subject. Two approaches you can use are the Venn Diagram and Listing. A Venn Diagram shows similarities and differences of subjects. It has 2 overlapping circles with a wide space in the middle. This space shows what the subjects have in common. Each circle represents a subject. List similar characteristics or points in the overlapping section. All other points are in the outer part of the circles. See the Compare and Contrast Paper Venn Diagram below. But what if you are comparing and contrasting 3 subjects? Add a third circle to the Venn Diagram. Part of the third circle overlaps with the other circles. 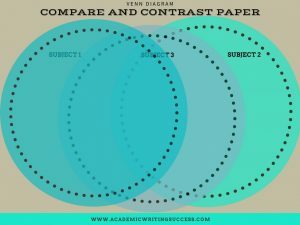 See the Compare and Contrast Paper Venn Diagram–3 Subjects below. There is also overlapping space between 2 subjects. Two subjects may have something in common that differs from the third. Write down the points of each subject in a circle. Everything the subjects have in common goes in a shared space. Every characteristic that is different goes to the other part of the circle. This activity gives you a visual representation of what is in common or different with each element. The listing method also helps you select the points you want to focus on in a paper. To do this activity, write the title/name of each subject you’re comparing and contrasting. List all of the characteristics of each subject. Then highlight or circle the things that are similar or in common. The things that aren’t highlighted are contrasting characteristics. Listing helps you discover what points to compare and contrast. Next, you need to find evidence that will show how the points for each subject compare and contrast with the elements of the other subject(s). For example, if you are comparing and contrasting two world leaders then you want to find facts about each person. This could be evidence of decisions he/she made, quotes from things he/she did etc. As you find evidence ask yourself the question, “So, what?” What is the significance of each piece of evidence? What conclusion can you draw from it? How does this piece of evidence relate to other supporting details or evidence you found? The “So, what?” question deepens your thinking about the content of your paper. It shows your critical analysis of each subject and point. The analysis makes your paper more meaningful than a paper that only tells the reader what is similar and different. Once you can answer, “So, what?” go on to outline your paper. It’s easier to write a compare and contrast paper when you outline your content first. 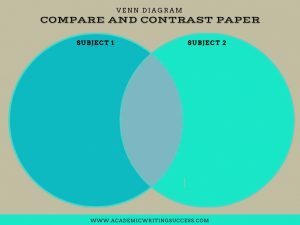 There are 2 common ways to structure a compare and contrast essay or paper: Subject by Subject or Point by Point. If you have a third subject add a part C section to the body of your outline. If you have more points you want to make, add them to the body of your paper. If you have 3 subjects you can add the third subject to each point. Both of these outlines help you structure a compare and contrast paper. Select the one that makes sense to you. If you can’t decide, outline your content both ways and see which one looks more logical. Organize your academic paper, so that it is easy for your reader to follow. The more planning and preparation you do, the easier it is to write your paper. In this phase of the writing process, take the content in your outline and put it into writing. Write all the parts of your paper, an engaging introduction, a well-developed body and a memorable conclusion. Make sure you include in-text citations. And end with a meaningful statement showing your reader the significance of your paper. When you finish your paper revise it. 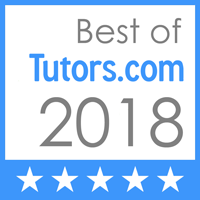 For tips on how to revise your writing, check out the post, “Academic Revising 101: The Essential Essay Revision Checklist” https://www.academicwritingsuccess.com/academic-revising-101-the-essential-essay-revision-checklist/. Do you have to follow every step in this process? Do you have to write an outline? No. 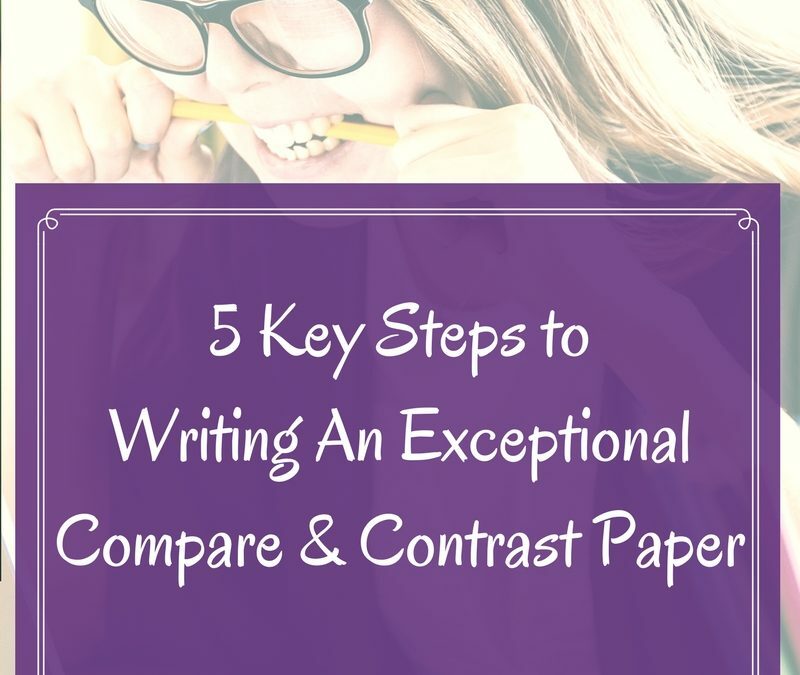 But these 5 steps will help you write an in-depth compare and contrast paper. A great paper that shows a high-level of analysis that stands out to your professor. The critical thinking your paper demonstrates is what makes your writing outstanding. Grammar, writing mechanics and writing style are important, but unless you show a deep understanding of your topic, your paper is fluff. Follow this 5-step process so that you can prepare, plan and write a first-rate compare and contrast paper. Did this post help you? Share it online, with someone you think can benefit from it, or Pin it to Pinterest (or even all 3)!